scheduled tours from Inverness to Orkney run by John o'Groats Ferries please click here. This tour is available mainly September to March - click here for further information. 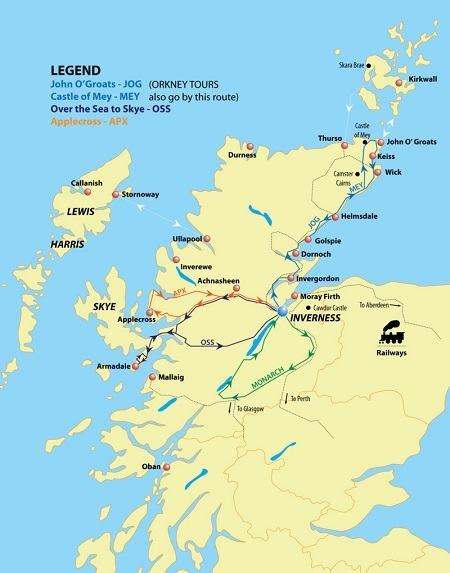 This is the only day-trip from Inverness to Orkney which visits the top prehistoric sites - Skara Brae; the rings of Brodgar & Stenness; and Maeshowe - and which gives you sufficient time at each of these antiquities. You also see a number of important features relating to the World Wars. According to your priorities you also have time for a short visit to Kirkwall, Orkney's capital. For our crossings to Orkney we use MV Pentalina (Pentland Ferries). During the crossings we see a variety of wildlife; often seals are seen before we leave mainland Scotland and seabirds are seen on all trips. Click here for a map showing the relationship of Inverness to Orkney. 0600 hrs We meet you at your accommodation in Inverness. Drive north by the coast road to Gills Bay (near John o'Groats), with a breakfast/comfort stop. On our way we pass cliff-top castles, wild moorland scenery and a variety of prehistoric sites including the broch of Càrn Liath. 0930: Depart Gills Bay for the scenic 1-hour crossing, taking us under Stroma, Swona and the great gun emplacements which guarded Hoxa Sound during the Second World War. Swona, where the Pentland Firth meets Scapa Flow. This island, which rarely experiences frost, is at the same latitude as frigid Churchill on Hudson's Bay, haunt of the ice-bear! Swona is now uninhabited, except by seabirds and its famous herd of feral cattle. Skara Brae, best-preserved stone-age village in Europe. We have 1¼-1½ hours here; you may spend some of your time in nearby Skaill House, with its account of the discovery of Skara Brae. (NB: while Skara Brae is open all year, Skaill House is usually closed autumn to spring.) This is also our lunch stop. Admission fee applies. 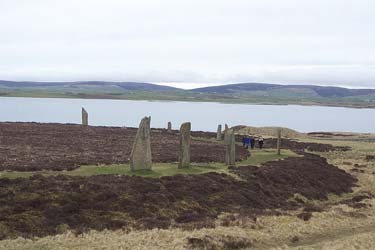 A fifteen minute drive brings us to the Rings of Brodgar (see photos below) and Stenness - we spend up to 45 minutes at these two great circles. Maeshowe is widely considered to be one of the finest passage graves in the British Isles. We start from the visitor centre at Stenness, a mile to the west of the footpath to Maeshowe. 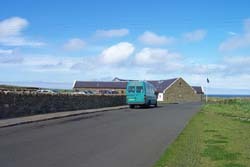 Parking there, clients check in at the visitor centre and then ride in a dedicated transfer bus to a parking area across the road from the Maeshowe path. I wait for you at the visitor centre. Admission fee applies. Maeshowe from the air. 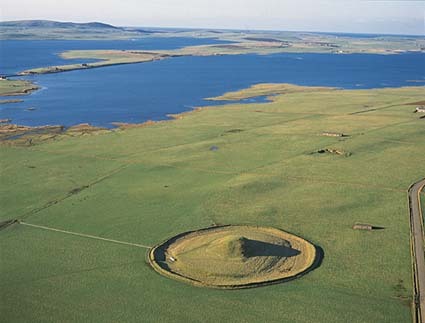 Beyond, the lochs of Harray and Stenness; the Ring of Brodgar is between these lochs, on a brown knoll almost directly 'above' the mound of Maeshowe. 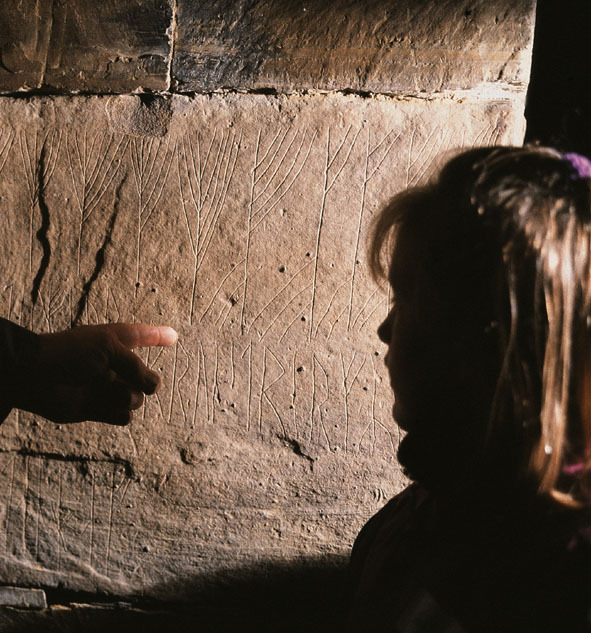 This is the Neolithic heartland of Orkney and only GO-ORKNEY takes you to Maeshowe on a day tour from Inverness. Having completed our visits to the four "Major Monuments" we return to the ferry terminal at Saint Margaret's Hope for departure just before 5pm (1650 hrs). 2100-2115hrs: Return to Inverness, passing the stone 'circle' - actually more a horseshoe - of Achavanich en route, and drop you at your accommodation. This tour is available in principle from September to March except 25 December and 1 January, when the ferry doesn't run. In practice I have other commitments so it is good to give a selection of dates if possible. I try to keep the list of "available" dates below up-to-date. I may be available some days April to August with an extra fee of £ 100. Assuming we have made normal progress, we stop about 0820 hrs at a supermarket in Wick. At the cafeteria you can get hot or cold breakfast and drinks. There are toilets, and you can also buy picnic and snack food. Lunch: Some accommodations in Inverness can be quite insistent about leaving cold food out for your breakfast. At 0530 in the morning, even I don't usually have much of an appetite! If your accommodation is on a "bed & breakfast" basis you may be able to negotiate a packed lunch in lieu of breakfast. Otherwise, as noted above, you can get picnic food at our stop in Wick, or you can lunch in the café at Skara Brae. Contact, cost. E-mail us here for prices and how to book. (As a guide, tour price for 2 persons this season - September 2018 to March 2019 - is £ 550.) Prices given include all surface transport by vehicle and ferry from Inverness to Orkney and back, and within Orkney; and guidance. Pick-up and drop-off at accommodations within the city of Inverness are also included. No food or admission charges are included. Both Skara Brae and Maeshowe are in the care of Historic Environment Scotland - that URL should take you directly to details of concessionary schemes such as the Explorer Passes. 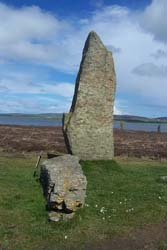 We also give you detailed notes on the trip, and guide books on the major monuments and other aspects of Orkney are available for you to read on the journey north, or on the ferry. Although this is a somewhat untidy broch it has the most stunning position of the many I have visited, and lets you add an Iron Age feature to your "portfolio". 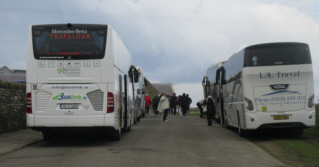 The left picture is how the bus park at Skara Brae often looks when we arrive - just one little coach! The right picture shows it as we're leaving - we're nearly always ahead of the crowd!